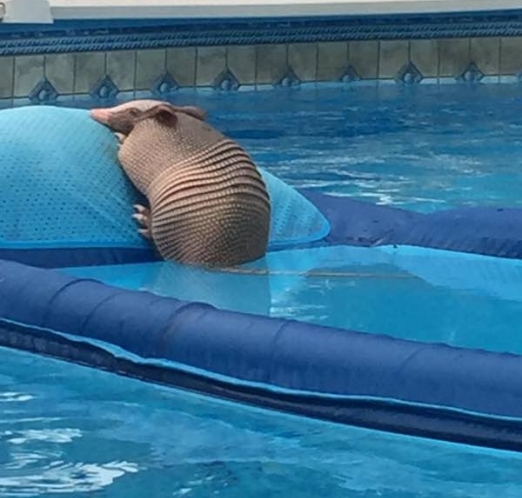 Armadillos are a common sight in East Texas, but armadillos catching some rays and chillin’ in your pool, well, that’s a little more unusual. 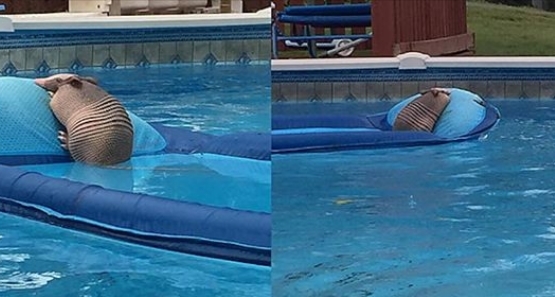 Tammy Anderson of Nacogdoches, Texas, was checking on her sister-in-law’s house while she was away on vacation and found the unexpected visitor in the family’s pool. She approached the dark shape trepidatiously and recognized it was an armadillo, relaxing on a float in the pool! Tammy couldn’t quite believe what she was seeing, so she had her mom come take a look too. Yep, an armadillo. The two decided to help the creature out of the pool as it appeared the little fella was in no hurry to leave the cool water on the hot summer day. “It’s just chillin, ain’t it?” Tammy’s mother proclaimed in the video she shot of the strange sight. And to Dolly the dog’s credit, she was more curious about the armadillo visitor than suspicious and knew well enough to leave the critter alone. West told the Dodo afterwards that she and her family will welcome the armadillo back, should he decide to cool off in the pool again. Responses to "Armadillo Found Chillin’ In Pool And In No Hurry To Leave"